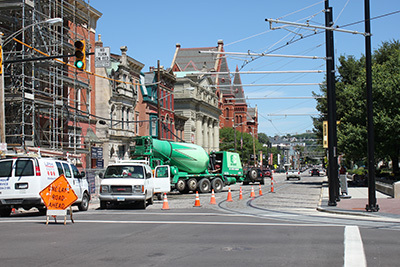 The Kleingers Group recently created plans for the first underground utility connection installed under the new Cincinnati Streetcar while the overhead lines are energized. Streetcar construction in downtown Over-the-Rhine. Kleingers drafted plans for the first underground utility line under energized overhead lines. Specifically, the Water Service Branch Plan created by Kleingers identifies the routing of a new water service line and the location of the bore pits required to tunnel under the streetcar line. Like most projects in an urban setting, the routing of the new waterline had to be configured in a tight space while avoiding a number of existing utilities, all at various depths. The location of the bore pits also had to be chosen carefully to work around a large number of existing utilities. The new water line, installed by Greater Cincinnati Water Works, will service a building currently under renovation by 3CDC. Plans submitted to Greater Cincinnati Water Works were approved the same day, allowing work to begin quickly. The project is expected to be the first of many to come that will require extra care to work around the tracks for the Cincinnati Streetcar.